Aristo vs Supra 2JZ VVTI motor? So I've decided to go 2JZ VVTI. My Samberg subframe just showed up yesterday, and I have to decide between the AR-5 or the RS5R30A. I'm hoping to get this thing kicked off by summer. I've been looking around locally and I've been able to find Aristo 2JZ VVTI engines for ~ $1850. Looking online I've found one out of a Supra that would be ~$3800. The Supra is a manual trans motor set and comes with ECU and harness, but no trans. The Aristo comes with all of the same plus an automatic trans for $1850. I'd love to buy a Supra motor set local, but he told me he rarely sees the Supra sets. Am I overlooking something that indicates the $2K difference? I figure the lack of a clutch fan would be nice, but it seems that the OEM Aristo ECU is a bit finicky. I'm planning on running an ECUMaster so I was curious if the Supra motorset would really serve any benefit over the Aristo at this point. Thanks in advance. I have a lot to learn, but still would liek advice so I can go ahead and get mock-ups underway. i just checked my thread on the supra forums about the difference between a 13bt and a 13brew. Is it a difference in the sump location? Front, mid, or rear sump on the oil pan? I know this is the difference between some of the 1JZ motors depending on which car is was pulled from. yes, one has a front sump and the other is rear. that's the only difference (aside from the ecu, but you should use a stand alone anyway). i just checked my thread on the supra forums about the difference between a 13bt and a 13brew. no reply yet either. Pretty much everything on Supra forums is catered to Supras in which case a Supra pullout would certainly justify the ease of installment. Same goes for the threads by the GS300 guys witht he Aristo motor. We have members that have done the JZ swaps, hence why I posted here since it seems relevant to the car. Clutch fan, PS pump, something with a water sender, ECU (Aristos only had autos as well), harness, motor mounts, motor mount bracket were other differences I noted. I was just curious if there was something I was overlooking that would justify the $2000 difference before I go pick it up. Check out 1jz engines too. Still make easy 600whp and can often be had a lot cheaper. Nothing justifies he price difference. If the supra 2J was coming with the gertrag then yes. It's just like people here pay more for short blocks that come out of a car they know and pay less for jdm import motors that are more of a crapshoot. The 1JZ VVTI is actually how I started down this path. I thought it was a good option for kind of keep the RX7 style the same, with it's undersquare motor and revvy personality. Then I saw that not a whole lot of people build them and it would be more effective to use the 2J bottom end. I know the 1J head was proven to flow worse than the 2J heads, but I'm not really sure about the real world impact it would have @30psi. I talked to ATS's owner about his experience and he said the 6265 felt pretty laggy on the 1J Supra one of his old employees had, so I figured power wise it wasn't really what I was looking for and almost all of them are front sump except some late model Soarers I believe and so it seemed to make sense to take the .5L for spool and torque which would be optimal for everyday driving. I'm really curious if a cast manifold will fit in the 7 engine bay with a PTE 6266/6466 as I think it would be a solid relatively responsive street setup. Thank you! I really wanted to hear someone else say it besides me. The reason why the price is much different between the supra 2JZ (non VVTI) and the aristo VVTI engine is indeed, the VVTI. Everyone is afraid that the VVTI is much harder to tune hence why they are less desirable. 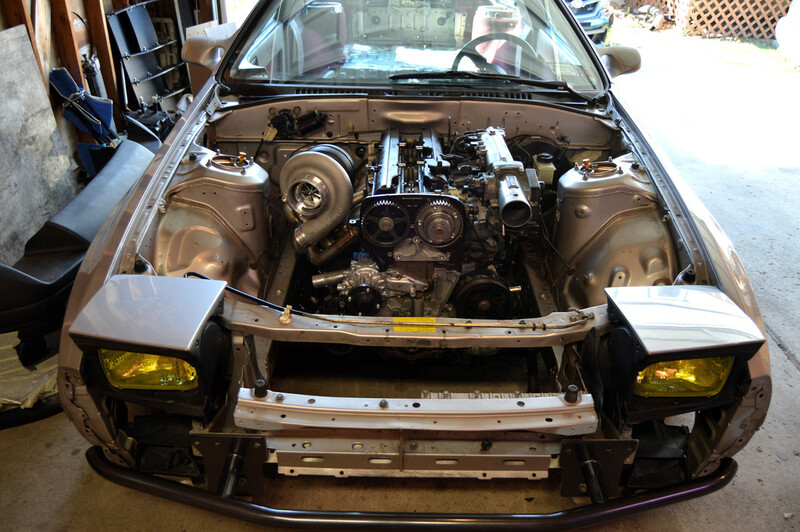 The motor mounts actually mount to a different set of holes on the passenger side but the second set of holes on the block is the same on the supra 2JZ. aristo injectors are 440CC as opposed to supra 550CC. The other main difference is the DBW style throttle body which is a pain in the *** when tuning. Other than that the water pump is slightly different, and the turbochargers have ceramic turbine wheels which do not hold as much boost as the supra turbos. Running the aristo stock ECU usually is not an option unless you run the stock auto trans. with all of the VSS and transmission sensors unplugged, the ECU goes into limp mode ( controlled by DBW throttle). I have heard that you can ground a circuit to trick the ECU into thinking it is in neutral to avoid this but im not 100% sure. Here is my build with the VVTI 2JZ. I will be running adaptronics new modular series ECU. The reason why the price is much different between the supra 2JZ (non VVTI) and the aristo VVTI engine is indeed, the VVTI. Everyone is afraid that the VVTI is much harder to tune hence why they are less desirable. Quick Reply: Aristo vs Supra 2JZ VVTI motor?